Disclosure: This post was sponsored by SkipTheDishes. The views and opinions expressed in this blog, however, are purely my own. This March Break, we decided to stay home for a staycation. Wendy couldn’t get the time off work, as she had a lot going on with others off. Three of the seven people in my office had booked vacation already, so I felt pretty fortunate I was able to work the entire week from home. While we would have loved to escape the cold weather for a more tropical climate, organizing a family getaway posed a challenge. Our family had just spent 3 days with friends in Wellsville, NY for Family Day, where we had a lot of fun. We went tubing at Holiday Valley, bowling, ate some wonderful food, went shopping, and played lots of board games. We set expectations with the girls throughout the year that we go camping a few times in the summer and do mini getaways throughout the year in lieu of a one-week tropical vacation, which we will do when the opportunity arises. We visited Cuba in 2013, and Jamaica in 2017. We also did a pretty awesome 3-week road trip to Florida in 2016. I figure we’ll need to take them somewhere in 2021! Storm was pretty happy we were staying home. Although she loves visiting her friends at the kennel, she loves having her two big sisters home even more. Our weekly extra-curricular activities (Girl Guides, Pathfinders, flute lessons, youth group) were cancelled for the week. These activities normally make our schedule on weeknights quite full. The girls either went out or had friends over during the day, and we reserved each night for some quality family time. When we do go away, we love trying new foods and enjoying dishes we love. With a family of foodies, a staycation can be tough, especially when you just want to relax and not cook. So on the Tuesday and Wednesday, we decided to order our dinner from SkipTheDishes. Half the fun of winter escapes is getting to experience new food, which is what makes Skip’s restaurant selection so appealing. They have such a huge selection for us to choose from, and it is right at our fingertips! As well, Skip helps busy families like ours take the hassle out of preparing a meal, whether it be lunch or dinner, so we can spend more quality time together. While they can’t promise to beat the sun or sand, SkipTheDishes does offer a wide variety of cuisines from different restaurants, including popular dishes from popular travel destinations, like mouth-watering homemade pastas from Levetto, or the infamous tacos from Grand Electric, both of which can be found through SkipTheDishes website or mobile app. Even though we were not escaping to a tropical destination, we were able to order our favourite travel-inspired foods – Thai and Japanese, which made our staycation feel that much more like a real getaway. Thanks to local restaurateurs and over 15,000 options on the Skip network, I was able to order dinner from Funky Thai 2 Go and August 8 through Skip’s mobile app, all from the comfort of my couch. The SkipTheDishes mobile app makes it so easy for you to order from restaurants in your area. It shows you the distance from home to your choice of restaurant. You can enter multiple addresses, so ordering from home, work, or a friends place is made simple. When I saw that the SkipTheDishes driver was close, I went to the door, and he was walking up our driveway. Ural, our delivery driver, was very friendly. He handed us our order, which was nice and hot, and away he went. Receiving the delivery was so easy because the payment and tip were handled completely in the SkipTheDishes app. Seeing as we didn’t go away on vacation, we all agreed to have something from places we would love to visit… Japan and Thailand! Although you can’t really discover those two countries in just one week, you can certainly find their food represented on SkipTheDishes! On Tuesday, we ordered from August 8, a local Japanese restaurant – dynamite rolls, California rolls, avocado and cucumber rolls, yam tempura, shrimp tempura, deep fried scallops and tempura vegetables. Lauren and Rachel were in heaven! They love Japanese food! 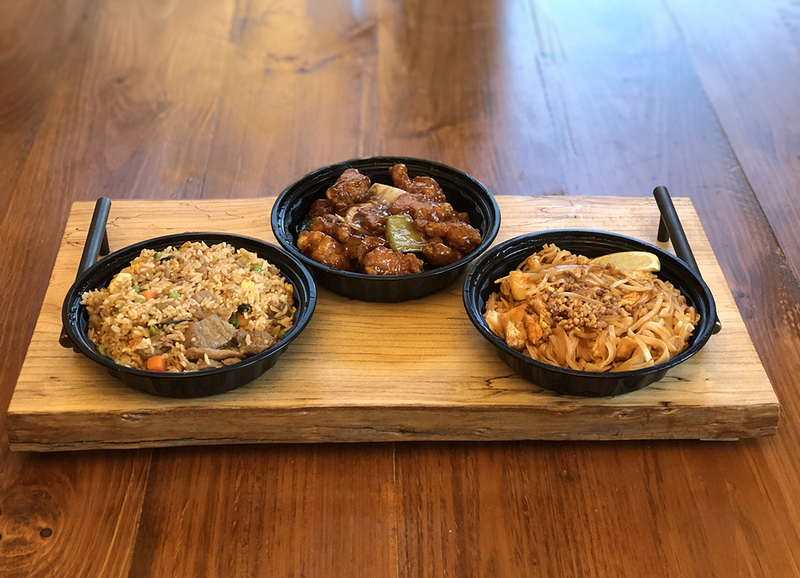 On Wednesday, we ordered from Funky Thai 2 Go – Thai red chicken curry with Jasmine rice, basil beef rice, General Tso’s chicken, and chicken pad Thai. While Wendy and the girls devoured the Pad Thai, I enjoyed the Thai red chicken curry all to myself! It’s one of my favourite Thai dishes. Of course, we had to watch the Hangover II on Netflix, as it takes place primarily in Thailand! The awesome local selection on the SkipTheDishes app takes the “what do you feel like eating” question out of ordering food. The app is so easy to navigate, and the menu for each restaurant is right there in the app. It was a great staycation March Break – Wendy and I both worked, but because we didn’t have to cook, we got to spend some awesome time with the girls, without the extra-curricular or worries of homework. We saw another awesome Marvel movie at our local cinema, ate some great food, had a few epic sets in Rock Band, watched a few movies on Netflix, got in our weekly Riverdale fix, visited with my parents, and the girls even had some friends over for a sleepover on the weekend. Proof that a staycation can be just as fun as going away. Your time is what you make it. Make the most of it. A big thanks to SkipTheDishes for making dinner decision making easy this week, and allowing our taste buds to travel to Japan and Thailand while we stayed in the comforts of our own home. For a chance to win a $200 voucher for SkipTheDishes, check out my Instagram post here, contest ends March 24, 2019 at 11:59 PM EST. Ural was fantastic. he was like “you want to take my picture? You got it!” and then he posed just like that! He definitely loves what he does. We just started using SkipTheDishes, and I gotta say, we love it! Good luck in the contest! This sounds like an awesome service. We love staycations! They are so much easier when you have three kids. They really can be fun. It all depends on what you do. seems like a pretty cool app. i love things that make life more convenient. It definitely makes life a lot easier. There is a great selection of restaurants to choose from. Nice reading about your staycation. You surely had a fun time with your family. We really did. Staycations can be just as fun as going away, if you plan right. And meals were easy with the SkipTheDishes app. It looks like you had a lovely staycation! Sadly I’m not Canadian so we don’t have skip the dishes here, but your food looked delicious! It’s a great service! They are in some areas of the US right now (Nebraska, Missouri, Ohio, and New York). I like your post! A staycation means relaxation. We definitely try this cool app. It really does take the stress out of ordering food. Family time is always a great time. I loved your post about your staycation as well as review. Thanks so much for reading. Family time is the best time! ww I wish we had a skipthedishes here in texas! def makes enjoying a staycation much easier when you dont have to mess with cooking so much! T really makes things easier. Hopefully they make their way down to the Lone Star State! I love staying in and ordering take out! We use a similar app that delivers from local restaurants. Makes busy nights so much easier! Ordering in made things so much easier for us during our staycation. I should do this with my daughters over Spring Break! Sounds like a great idea! Staycations are great if you don’t have the vacation time. We had a lot of fun! I love it! Skip The Dishes is one of those names that makes me think, “why didn’t I ever think of this name?” The food looks mighty delicious. Looks like you had an amazing staycation with lots of fun and a good mix of activities. Right? It is a catchy name. All of the food we had was fantastic! There is map on their site that shows coverage. If it is available, there is a link to download the app in my post. Looks like you are creating some great family memories! I loved trips like this when I was a kid. So many opportunities for great conversations. Oh wow, Looks like a great staycation with the whole fam. Everyone looks so happy. What a great way to order food. I’ll ahve to check this out now. It was a lot of fun… especially the Rock Band night. One of the restaurants we ordered from was the first time my girls have tried their food, and they loved it. Such a fun and a great experience you had. Sounds like a very convenient way to order food. It is quite convenient. Definitely made our dinner making plans easier. Both meals were delicious! We had a great week. Food looks great to fuel a great week. Love the ease and convince of this delivery service all done in the comfort of your own home. The ease and convenience of using SkipTheDishes helped us have a simple dinner process with great food, and very little cleanup afterwards. That take out food looks incredible! I need to check out his app!! SkipTheDishes is super convenient. You’ll love how easy the ordering system is. Oh it was delicious! We’ve ordered from them a few times. Exactly… no worrying about your order… you enter what you want, pay, and wait for your food to arrive. So easy and hassle free!